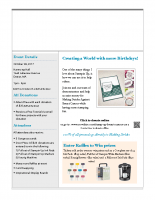 One of the many things I love about Stampin Up, is how we can use it to help others. 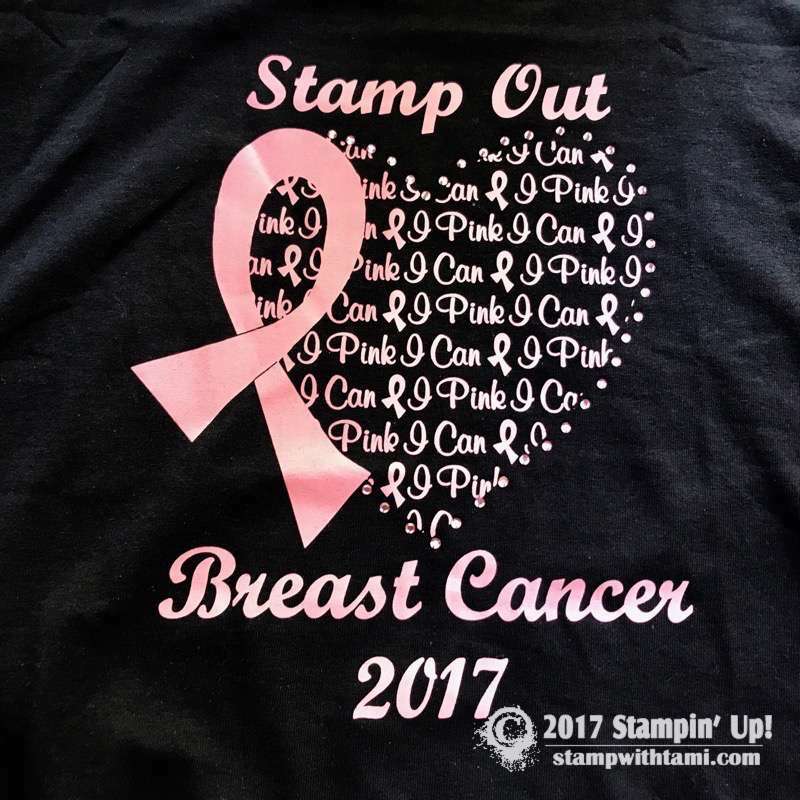 Join me and our team of demonstrators and help us raise money for Making Strides Against Breast Cancer while having some stamping fun. Help us meet our goal of $6,000! A keynote speaker/survivor’s once had some very powerful words. She said “Last year, I attended this event and was encouraged to go get a mammogram. You talked about the importance of early detection. I was diagnosed, treated, and today, I stand before you Cancer free, Thank you.” Talk about changing lives! All donations receive a free tutorial and entry to win one of our awesome Door prizes*. Whether you attend or not. Please leave a comment below after donating and be entered into my bonus drawing (details below). *This year’s door prizes are: Complete set of 54 Ink Pads ($273 value), Full Set of Stampin Write Markers ($110 value), Keurig Brewer ($90 value). 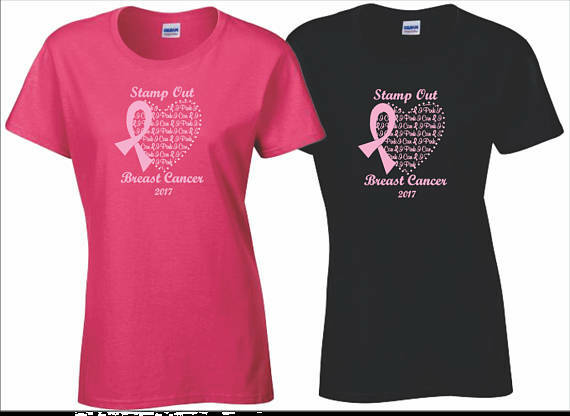 Check out our new “I Pink I Can” Stamp Out Breast Cancer T-Shirts with pink rhinestones. My friend Tamra Davis made these, and she is donating 10% of each t-shirt sale to our Making Strides team. If you’d like one, you can purchase them in her etsy store here. BONUS!!!! If you make a donation by October 31, and post below I’ll enter you in a drawing to win a free Ribbon of Hope stamps and die set. Winner posted in my Winners Circle. Door Prize: All $20 donations are entered to win the following: Complete set of 54 Ink Pads ($273 value), Full Set of Stampin Write Markers ($110 value), Keurig Brewer ($90 value) and a Full set of Ink Pads ($250 value). As always you are a strong voice and advocate for special causes….I am so very proud of you! So very proud to donate in support of a very important cause. I lost my sister, Idona, three years ago to breast cancer — she was three weeks shy of her 50th birthday. My sister, Carrie, has survived breast cancer for 16 years. Our family carries the BRCA 2 genetic mutation. I was diagnosed with this syndrome at age 54 (seven years ago). The pathology after my double mastectomy indicated many atypical cells which would have resulted in a breast cancer diagnosis at a future time. So PLEASE ladies and guys, if you have a history of breast or ovarian cancer in your family, get BRCA tested TODAY! Your insurance will cover most of the cost. Thank you again, Tami, for leading this group of stampers for a cause that is very close to my heart! I made a donation in tribute to family and a friend. I then shared the Crowdwise donation link to promote and support your efforts. I was disappointed as I expected your photograph of your STAMP OUT CANCER 2017 campaign to be a part of that “share”. Your efforts should be getting the visual credit of your fundraising campaign for breast cancer! HEY it’s October…Breast Cancer awareness month! Is there a way for you to link your photo so that donors posting and sharing their donation via the Crowdwise link can spread the word with a eye catching photo? Let’s STAMP OUT breast cancer! Thank you for becoming involved in this campaign. I am going to be a 5 year survivor come January 2018. Woohoo!! I lost my mom back in 1986 to Stage 4 breast cancer after a 6 year battle. She was only 46. My sister was diagnosed at the age of 45 & is an 11 year survivor!! Woohoo-again!! I was diagnosed at age 47. My sister & I are both BRCA – I cannot stress enough the importance of yearly screenings!! It is a must!! We as women & men have to take care of ourselves so that we can be there for our families. I could not have gotten through this without the strong support of my family & friends & especially through my faith in God!! I am today a changed person. I take every day as if it is a blessing & I don’t sweat the small stuff. I am a voice of someone who has been so effected by this disease but have not made it weaken me- I stand strong in the HOPE that breast cancer will one day be 100% treatable so that my children & grandchildren will not have to fear or deal with it. Thank you for your involvement with this campaign. The importance of the yearly exams can not be stressed enough. Three years ago I was diagnosed with stage 3. With the strong support of my family and friends I got through it. On my good days stamping helped me feel creative and I was able to make others happy by sending them a truly one of a kind special card. So far 3 years out and no recurrence!!! Stamping was my therapy!!! Hopefully one day we will have a cure so no one has to go through all the ups and downs that this disease brings. I love the t-shirt design. Many of us are touched by breast cancer or cancer and we cannot stop fighting to find a cure. Early detection is important, but it is also important that you advocate for yourself in regards to your health. Don’t let a doctor tell you “Don’t worry about it”. If you feel something is not right push for answers and if your doctor brushes you off, find someone who will listen to you. Stand up to Cancer and Stamp it out!!! The T-shirt is so pretty. I’m actually a bone cancer survivor so I understand the fight and really appreciate you championing the cause. Good job Tami. Keep up the good work. Let’s help Stamp Out Breast Cancer!! As a Breast Cancer Survivor…THANK YOU! Tami you are Top Notch. Thank you for all you do. From your Stamp Out Breast Csncer, your live shows, everything else behind the scene that we don’t see, for your kindness and the list could go on. I made a donation but no one in my family ever had Breast Cancer. However, my youngest daughter had cancer, Astrocytoma of the right temporal lobe. Fought on and off for 10 years. My oldest daughter Is fighting ovarian cancer now. Thats why I donated. God Bless to all who are fighting and to those that have survived. Both My grandmothers, my mother, my aunt survived breast cancer I hope my donation helps others survive also. I purchased the awesome pink tShirt. I made a donation to The American Cancer Society. Now I’m making a comment to be entered into a special drawing. I hope every Stamper who sees this will do likewise. Thank You Tami! 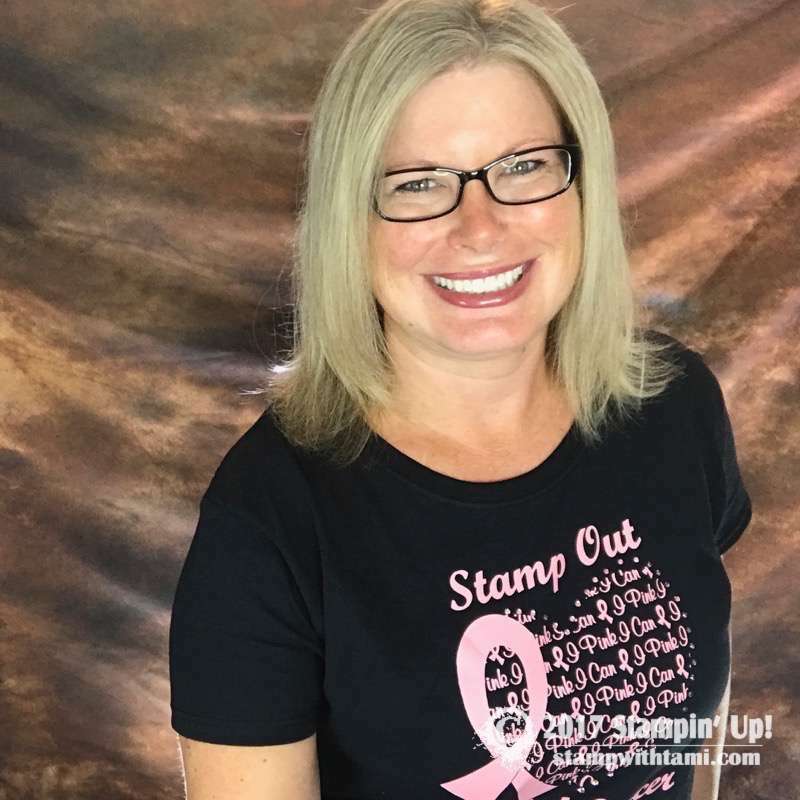 I love your passion both in this campaign and in your Stampin’ Up! business!